Introduction: Gena Philibert-Ortega is a genealogist and author of the book “From the Family Kitchen.” In this guest blog post, Gena writes about the extensive online collection of Spanish American newspapers available on GenealogyBank, and gives examples showing how these newspaper articles can help you research your Hispanic family members. Researching an immigrant ancestor or an immigrant community in the United States? Take a look at the ethnic newspapers available in GenealogyBank’s Historical Newspaper Archives. For genealogists doing research in an area where ethnic newspapers were published, that resource should be an integral part of your family history research. These ethnic newspapers printed news from back home, interviewed friends and family, reported on social events and activities, and provided a place for those new to America or with limited English language skills to feel connected. Those with Hispanic ancestors and family will appreciate the collection of over 350 Spanish-language newspapers available online at GenealogyBank. The Hispanic collection’s newspaper coverage crosses the country and spans from the very early 1800s to the 1970s. The early Hispanic American newspapers are fantastic resources to learn what life was like for your immigrant ancestors. Currently, states with news coverage include: Arizona, California, Colorado, Florida, Illinois, Kansas, Louisiana, Massachusetts, Missouri, New Mexico, New York, Texas, and Wisconsin. For many genealogists, an introduction to newspaper research begins with looking for family obituaries. According to the chapter “Newspapers” found in the genealogy classic The Source (edited by Loretto Dennis Szucs and Sandra Hargreaves Luebking): “Where major local newspapers often overlooked or carried one-line death notices of [immigrants], the person often received detailed notice in his or her ethnic newspaper.” The lesson here is to exhaust all newspapers for an area, local regional papers as well as ethnic newspapers, as you begin your obituary search. Here’s a good example of a full obituary found in an ethnic newspaper. 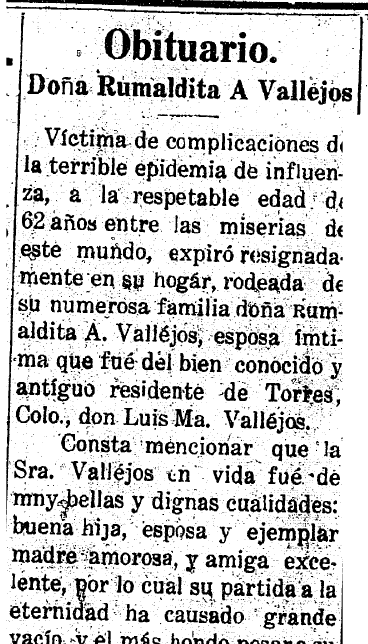 In this obituary for Dona Rumaldita A Vallejos, we learn some important family details as well as the cause of her death during the Spanish Flu epidemic. One reason some researchers may shy away from foreign-language newspapers is the language gap. Don’t let a newspaper article in your ancestor’s native tongue stop you. Remember that there are many online tools to help you translate a newspaper article. In the case of an obituary, you can quickly become familiar with the most commonly used words (names for family relationships, words for birth, death, occupation, etc.) after using Google Translate, a foreign-language dictionary, or genealogical word lists available from sources such as FamilySearch, to translate words in foreign languages. Don’t forget that newspapers aren’t just for finding information about a person’s death—they also document celebrations for the living. 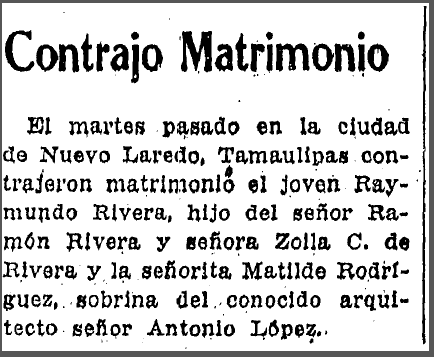 Consider this brief Spanish-language marriage announcement for Raymundo Rivera and Matilde Rodriguez. Here’s another marriage announcement in Spanish that includes more information, including where the happy newlywed couple will ultimately reside. Don’t forget about researching the younger members of a family. Articles about Hispanic traditions and social events such as quinceaneras can be found in American Spanish-language newspapers. 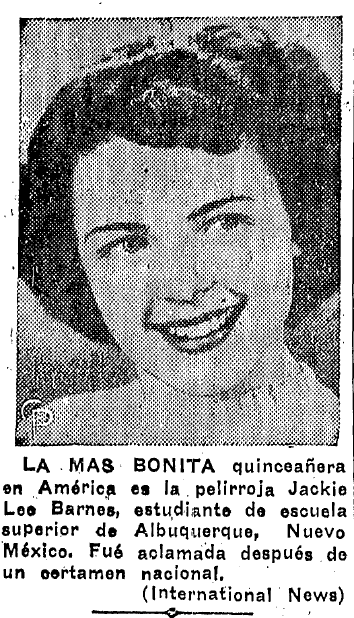 I love the following article from 1950 with the photo of an Albuquerque teen and its proclamation that she is the most beautiful 15-year-old in America. A nice added detail is that she is a redhead. 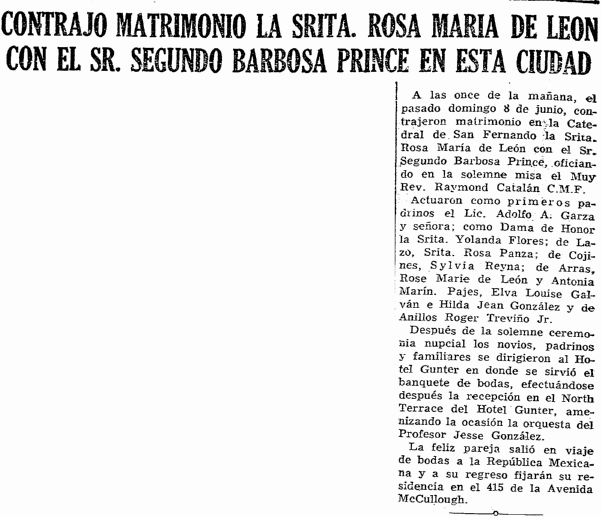 American Spanish-language newspapers can be a boon to a Hispanic family history researcher. As you scour them for clues in your genealogy research, make sure that you also look for English-language newspapers for additional articles about your Hispanic family members. Click the image below to go to the list of Hispanic American newspapers currently available on GenealogyBank for future reference. Feel free to share this list on your blog or website using the embed code provided below.